teacher, Science Teacher and PET Physical Education Teacher. There are total 19 posts are in this Giridih District KGBV Schools recruitment 2018. Those who qualified B.Ed with TET they are only eligible for this Full Time teachers jobs in KGBV Schools of Giridih District. These posts are Full Time Teachers jobs. 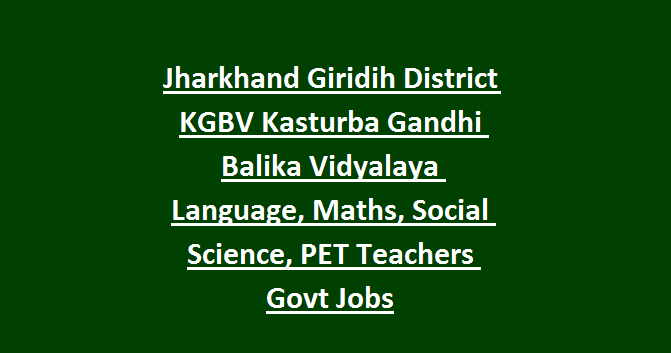 Submit application form in a prescribed format for this Giridih District KGBV Teachers Jobs. Application form is available for download at www.giridih.nic.in. Last date submission of application form to KGBV Giridih District schools is 30-11-2018. 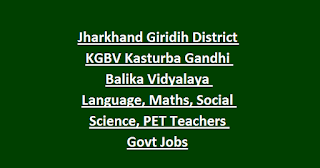 For more information about this Giridih District teachers jobs see the below given information. There are total 19 teacher posts in this KGBV Schools vacancy. Only female candidates eligible to apply for this Giridih District Kasturba Gandhi Balika Vidyalaya Schools recruitment 2018. Degree with B.Ed and TET qualification is required for applying this Full Time teachers jobs in KGBV Schools of Giridih District. For PET posts TET is not required. Degree with B.Ped or D.Ped is required. For 18-38 years for KGBV Schools Teachers jobs. For SC/ST candidates age limits are 18-40 years. Age limits cur off date is 01-11-2018. Candidates selection will be based on merit in based on TET marks and personal interview. Eligible candidates who are interested to work in kGBV schools they can apply for this Teacher posts. Last date to submit the filled application form to Giridih District Education Dept Is 30-11-2018.